With spring right around the corner now is the perfect time to start making this exfoliating gardeners cold process soap recipe. Make it now and it will be cured and ready right about time to put your first seedlings in the ground. I made this homemade pink and green exfoliating soap using two different batches of cold process soap and three fragrances – Farmer’s Market Baby Bibb fragrance oil, lemongrass essential oil and peppermint essential oil. However, you can customize the fragrance and look any way you like or make both batches of soap from the same recipe. To create this gardeners cold process soap recipe, you’ll begin by making the pink soap that will be the chunks inside the second batch of soap following your basic cold process soapmaking instructions. (This will fit inside one of my DIY Wooden Loaf Soap Molds.) You’ll need to weigh the ingredients using a digital kitchen scale. Begin by measuring out the distilled water into a pitcher or large glass Pyrex measuring cup, then weigh out the lye and stir into the water and set aside to cool. Then weigh out the soapmaking oils and combine in a large stainless steel pot. Heat on the stove over medium heat, removing from heat once all the oils have melted. Once the oils and lye-water reach about 100° F, you’re ready to make soap. Begin by measuring out and mixing the red orange oil locking mica shimmer into the oils with a stick blender. Once thoroughly combined, slowly pour the lye-water into the oils and mix until you reach a light trace. Add the Baby Bibb fragrance oil and mix thoroughly then pour into your prepared mold, cover and insulate for 24 hours. 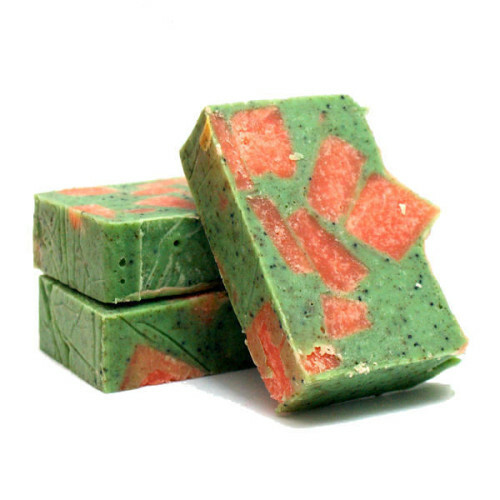 Once the 24 hour period has passed, unmold your soap and cut into square chunks. Prepare two molds for the next stage and evenly distribute the pink soap chunks between the two molds. You’re now ready to start on the second batch of exfoliating green soap. Repeat the same steps as your first batch of soap using the ingredients listed for the second batch mixing the green pigment and exfoliants into the melted soapmaking oils before adding the lye-water to ensure even distribution. Add the essential oils at a light trace and mix thoroughly. Now pour the soap evenly into each of the two prepared molds with the pink soap chunks. Tap each mold several times on the counter or table to make sure the soap gets around all of the chunks and to remove any air bubbles, then cover and insulate for 24 hours. After the insulation period you can unmold the soaps and cut into bars. Allow to cure for 3-6 weeks then package as desired with with professional plastic food wrap film , Kraft paper, or even fabric, and label. If you’re making these to sell, you’ll need to include the weight of each bar of soap on your label. For more great homemade soap recipes, be sure to follow my DIY Bath and Body Board on Pinterest. And for spring gardening ideas and how to’s check out my Pinterest Gardening Board! You can also keep up with all my DIY projects and handmade bath, body and beauty recipes by following me on Facebook, Twitter, Google+, Tumblr, Blog Lovin’ and Instagram! Hello Rebecca, I was wondering if you know the answer. I have made soap, which has to dry for 3 weeks, but now they start to look dried out. Do you know how come? Is it soda ash maybe? This can be caused by drastic temperature changes and will wash off. Hard to know for sure though without a photo.